Are You A Good Ball Striker? Ball striking is something that has gained more traction of late in the game of golf. With advancements in motion capture technology, flight simulators and ball tracking radars it is now possible to see how well someone is able to deliver the club to the ball consistently. Having the ability to deliver the club to the ball efficiently and consistently is called ball striking. This is something that I would like to take a little time and try and apply to baseball. Now, some of the differences between baseball and golf are: the ball is not moving in golf, excessive velocity in baseball, different planes of break from different pitches, time constraint in baseball, and not needing to hit a specific target in baseball per say such as a green in golf. Because of this, we are not able to directly transfer the term ball striking from golf to baseball. But we can apply some of the same concepts. Two major factors that go into “ball striking” for baseball are: attack angle and launch angle. These two metrics are very closely related when it comes to the overall result which includes launch angle, direction and exit velocity. Attack angle and launch angle play off of each other A TON in my opinion. Having the ability to generate YOUR individual high exit velocity relies greatly on your ability to CLOSELY match your attack and launch angle. It has been noted that a ratio of around 10° is most desirable. 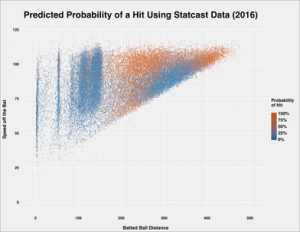 Anything much over that has been shown to decrease exit velocity even though average distance has often times increased, that is for another post. This kind of “strike” allows for a greater amount of energy transfer from the bat through the ball. For instance when you see an attack angle for at 9° and launch angle at 35° the overall ball distance could be 350’ however the velocity most likely will not be the players best considering his current exit velocity high. If the exit velocity is 93 mph and the distance is 350’ this very well could lead to consistent high fly ball outs that lead to a low on base percentage or batting average. 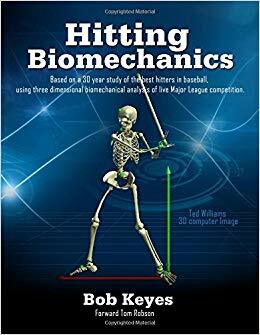 Conversely, if the same player has an attack angle of 10° and a launch angle of 11° because of the closeness of the two this hit can result in an exit velocity of over 100 mph which has a significantly higher percentage of the outcome being successful. At the end of the day the second result is more desirable at the college and professional level and will most likely lead to more productivity. Now, I am definitely an advocate for driving the ball in the air assuming the hitter has the tools to support that approach. The interesting part about this ratio is that most people do not have the average attack angle to support consistently trying to drive the ball at launch angles of 30° or higher. Based on the gathered metrics it has been shown that most amateurs have an average attack angle of about 5°-9° respectively. So, this data shows that most people are clearly doing themselves harm by just trying to live consistently in the high 20’s and 30’s of launch angles. In the end, we are really looking to get the player to develop the ability to drive the ball with excessive velocities that they are individually capable of. If one player has a high exit velocity of 105 mph and he miss hits a ball and it comes off the bat at 94 mph that is still a velocity that can generate plenty of distance and positive results. Versus another player that has a high exit velocity of 95 mph and he misses a ball and it comes off the bat at 84 mph and a launch angle of 35* this is most likely not going to produce as great of results over the long term. So where do we go from here? Some of the most important work and help that we can provide our athletes is to give them more feedback and specific result oriented numbers. If someone does not know what their average attack angle is then they cannot piece together their best plan of attack when it comes to them trying to set external oriented goals for themselves. One of the best drills that I like to use when making a hitter more aware of their angles is a drill I like to call “ball striking”. When executing this drill we like to use the BLAST baseball sensor and HitTrax. These two are very reliable in showing our attack and launch angle, with this we can make them more aware. First, we like to start on the tee and set a goal for them beforehand such as a 25° launch angle with an attack angle of 15°. This type of immediate feedback shows them how off they are in transferring as much energy through the ball as possible. 99% of the time they feel as if they are swinging straight up and when they get their feedback they quickly find that they are not doing that at all, it is more of a feel. Then we would graduate to front toss and then overhand. 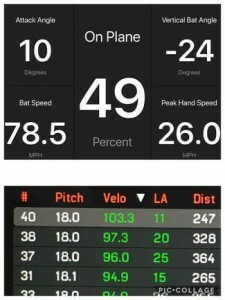 With this knowledge, we have seen great results in hard hit contact percentage and exit velocity average increase. I also believe this adds an element of difficulty for the players to try and closely match their two angles, which increases attentiveness and engagement. Let me know your thoughts. ​Start with the foundation in mind.